Jet-fighter from the Chinese Air Force. There have been build about 100-150 aircraft from the first version which started in 1979. From the second version - the J-8-2 - about 100 aircraft have been build and is similar with the Su-15 and the F-4. After they were upgraded with the Jian-8IIM upgrader which was developed by China and Russia to the which is the result of a modernized F-8M. 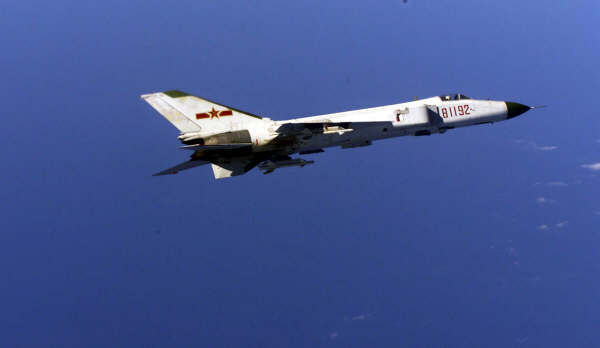 From the Jian-8IIM can be said that it's improved and equipped to better resist damage than the F-16A/C and the Mirage 2000. It should also have a better radar and better avionics than the F-16A/C, F-18A and the Mirage 2000-5. The aircraft can be equipped with advanced PL-9 and P-73 missiles. There have been bought about 150-200 Zhuk radars from a company in Russia for the new Jian-8IIM (F-8II) and the J-10. The Jian-8IIM hasn't large numbers of expensive material of composed titanium and moveable flaps so it's cheaper than the F-16C but more difficult to control the aircraft. The actioradius is also shorter than the F-16C.